What are FAST stroke symptoms and signs? What are other signs and symptoms of stroke in men and women? What are the signs and symptoms of a mini-stroke (TIA, transient ischemic attack)? What should I do if someone is exhibiting signs and symptoms of a stroke? Which specialties of doctors treat strokes? 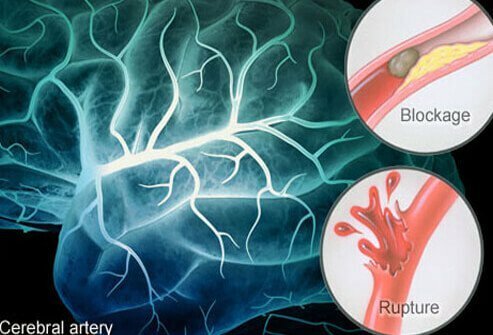 A stroke occurs when the blood supply to an area of the brain is cut off. The symptoms depend upon the region of the brain that is affected by the loss of blood supply and can include changes in sensation or motor control. Symptoms of a stroke also depend on how much of the brain tissue is deprived of blood supply. For example, someone who had a mild stroke may experience temporary weakness of an arm or leg, but those with a more severe stroke may be permanently paralyzed on one side of their body or be unable to speak. If the blood supply is not quickly restored, either on its own or via medical treatment, the effects may be permanent. A transient ischemic attack, or TIA, is sometimes referred to as a "mini-stroke." With a TIA, the stroke symptoms occur but go away on their own. Some people fully recover completely from strokes, but over two-thirds of stroke survivors are left with some type of disability. Acting fast is critical if you suspect that someone may be having a stroke. Immediate treatment of a stroke can minimize long-term effects of the stroke and can even help reduce a person's risk of death from stroke. FAST is an acronym that can help you quickly recognize the warning signs and symptoms of stroke. You can even download a FAST app from the webpage of the American Stroke Association to help you remember these signs. F: Face drooping. Ask the person to smile, and see if one side is drooping. One side of the face may also be numb, and the smile may appear uneven. A: Arm weakness. Ask the person to raise both arms. Is there weakness or numbness on one side? One arm drifting downward is a sign of one-sided arm weakness. S: Speech difficulty. People having a stroke may slur their speech or have trouble speaking at all. Speech may be incomprehensible. Ask the person to repeat a simple sentence and look for any speech abnormality. T: Time to call 9-1-1! If a person shows any of the symptoms above, even if the symptoms went away, call 9-1-1 and get the person to a hospital immediately. While these are the hallmark symptoms of stroke, a stroke can cause disruption of any function of the nervous system. Symptoms of stroke typically occur on one side of the body and come on suddenly. With a transient ischemic attack (sometimes called a mini-stroke) the symptoms appear and may go away on their own. In any case, it is essential to get the affected person to a hospital as soon as possible to enable prompt treatment. Weakness or paralysis of any part of the body. Numbness or a "pins and needles" sensation anywhere in the body. The symptoms of a TIA or mini-stroke are the same as those of a stroke as listed above. With a mini-stroke, the symptoms go away on their own. Any symptoms of a stroke can occur during a mini-stroke. Remember to think and act FAST (Face drooping; Arm weakness; Speech difficulty; and Time to call 911!) if you see someone who may be having these symptoms. Don't delay and call 9-1-1 immediately. You may help save a life or reduce the chance of long-term disability. A person who is having a stroke is typically cared for in an emergency department, and initially seen by a specialist in emergency medicine. Doctors that are typically involved in the care of patients with stroke can include neurologists, endovascular surgical neuroradiology (ESNR) specialists, interventional radiologists (IR), interventional cardiologists (IC), and critical care specialists. "Spot a Stroke FAST: Stroke Warning Signs and Symptoms." American Heart Association. Blood that has been converted from a liquid to a solid state. See a picture of Blood Clot and learn more about the health topic. Take the Deep Vein Thrombosis and Pulmonary Embolism Quiz to learn causes, symptoms, and treatments for these two dangerous conditions.